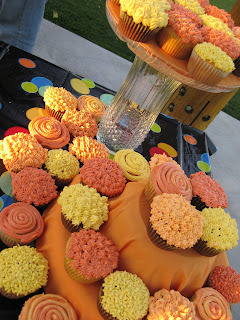 Here is my little offering of fall colored cupcakes for my sister-in-law's birthday party last Saturday. I made them in the same way as the cupcake bouquet for the baby shower in May. Basically, I used various star decorating tips and squeezed a blob of frosting out then slowly released pressure and lifted up the icing bag at the same time over and over again. The roses are just spirals using a large star tip. The variegated color comes from first adding one color of frosting and then another to the icing bag. Simple, but time-consuming. I thought they turned out lovely. Like a bunch of fall mums. The glass "cake platter" in the back was made from a vase and platter from a thrift store just hot glued together in a rush. I probably should have used some sort of epoxy, but it got a little stressful just before leaving. I got the idea from Stuff Lyssa Makes who got the idea from At Home With the Farmers Wife. Next time I'll have to try a candle stick holder. I kind of wish I had turned the vase upside down and glued the bottom so that I could have put something colorful inside to spice it up. I recently attended a funeral where in place of floral arrangements on the tables at the family luncheon they put cake platters with desserts. What a great idea for a wedding dinner, reception, or any big get together too. Talk about a money saver when you can get the candle holders/vases and platters from a thrift store, and you usually already have desserts at such things. These are GORGEOUS! You did an amazing job! I know, learning how to make those cake stands have been the best! Nice job!